Various orofacial neuropathies derive from a number of causes. Depending on the symptoms experienced, the diagnostic process may be different. For the three most common orofacial neuropathic pain conditions, diagnostic procedures may include the following tests, examinations and considerations. As with any diagnostic process, a doctor will take a full medical history and description of symptoms, perform a physical exam and any necessary tests or scans. Beyond evaluating symptoms, health history and performing a physical exam of the area affected, a doctor may recommend tests to identify medical problems. As with many pain conditions where the exact cause is unknown, trigeminal neuralgia is often diagnosed by eliminating other serious medical problems. A magnetic resonance imaging (MRI) scan may be performed to rule out the presence of a tumor or multiple sclerosis. Rarely, a high-definition magnetic resonance angiography (MRA) may identify where a blood vessel has compressed a nerve. 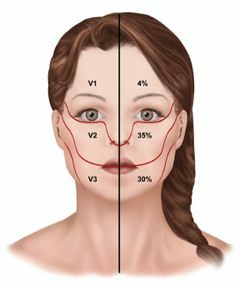 A MRA has been found to detect a vein or artery compressing a nerve in 80 percent of trigeminal neuralgia cases caused by nerve compression. Trigeminal neuralgia may also be positively identified if pain decreases with Tegretol treatment. No single test can reliably identify all cases of trigeminal neuralgia, so diagnosis is dependent on an accurate interpretation of a patient's signs and symptoms. Diagnosis of atypical neuralgias is difficult and relies on ruling out other possible causes. Along with a clear demonstration of atypical odontalgia symptoms, a doctor may recommend dental X-rays, a MRI or a CT scan to eliminate other possible conditions. Atypical odontalgia, or phantom tooth pain, is often only diagnosed after nerve blocks fail to reduce pain and if test results return no positive diagnoses. Nerve damage is typically diagnosed with one or more of the following tests. An electromyogram (EMG) records the muscle's electrical activity, with reduced activity suggesting injury to the nerve. A nerve conduction study measures the passing of electrical signals by placing electrodes at two points on the body. And an MRI, or MRA may produce a 3D image of the nerve detailed enough to identify damage. This complex neuropathic pain condition cannot be diagnosed with a single test, however a number of tests and scans can provide clues to a positive identification. An MRI scan can provide images of changes to tissues. Sympathetic nervous system tests may identify changes to skin temperature, blood flow, sweat or other disturbances to autonomic functions. Changes in bone and blood circulation can be seen with a triple-phase bone scan. An X-ray can identify loss of minerals in bones common in later stages of the condition.